This is probably the most important and many times, most overlooked information that should be checked. 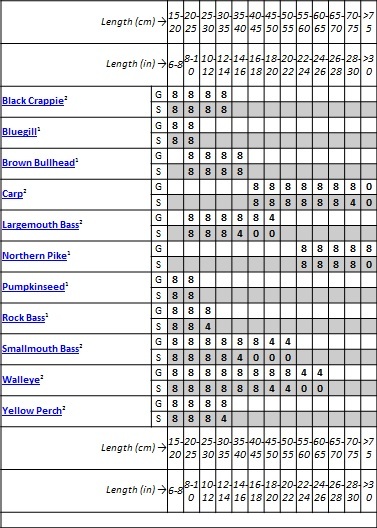 Open/closed seasons dates, catch limits, slot and/or size limits, and special areas of the waterbody that may be closed to fishing during certain time frames (e.g. spawning/migratory times). All this information helps keep us out of trouble and protect the fishery. Many jurisdictions publish fish consumption guidelines. These guidelines detail levels of toxins in fish (dimethyl mercury, DDT, PCB, etc.). Good to know if you plan on harvesting fish for a few meals but also a good source of information on some of the species that are present in an unknown waterbody. High toxin levels may also be an indication that fish populations may be stressed or declining. Click here to see Ontario’s “Guide to Eating Sport Fish“. Number identifies the contaminant or group of contaminants for which the fish was tested. Other information gained (from the Lake Partners Program) for Balsam Lake included Secchi Depth and total phosphorus. Secchi Depth has ranged from 3.3 m to 3.7 m over the last few years, similar to other lakes in the region that I’ve fished. The last reading for Total Phosphorus was 8.3μg/L. This puts it as an oligtrophic lake which is different from some of the other lakes (which are mesotrophic/eutrophic in nature (TP ranging from 17-25 μg/L) nearby. Balsam Lake is also part of the Trent-Severn Waterway so dams and locks along the waterway ensure very stable water levels. Good maps of the area you are fishing are probably the most useful tools you can have. A variety of types are listed here. Google Maps/Satellite Images: The satellite imagery from Google has been a spectacular help in researching new waterbodies, particularly ones where hydrographic and fishing maps are not available. Topographical Maps: The topography of the land beside the body of water can give some clues as to what is happening under the water in certain areas. Also shown is the location of river/creek inlets and outlets, islands, bays and landmarks such as roads, bridges and buildings. A good source is Toporama,an online set of topographic maps for Canada. 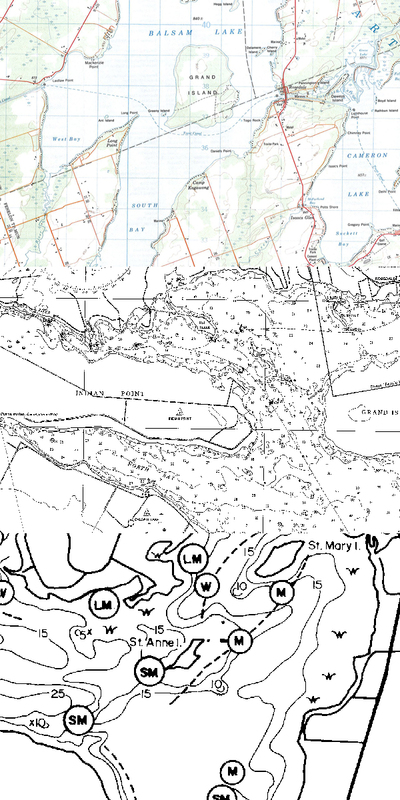 Hydrographic/Bathymetric/Nautical/Navigational Maps: Navigation, water depths, shoals, sunken islands, deep holes, boat launches, marinas – the holy grail of researching a new lake. Fishing Maps: A lot of times fishing camps and resorts will hand out homemade maps of the waterbody they reside on. More popular destinations have higher quality fishing maps that are available for purchase. I’ve collected maps from all over the place but one of the best resources (besides a good internet search) is from the local university. Many universities maintain research grade map libraries that hold a variety of map type collections. A great example of this is the Map and Data Center at Western University. I was able to take a copy of topographical, navigational and fishing maps here. Chatting with people at the boat launch can certainly be helpful. A simple “How was the fishing?” is a good place to start a conversation. Bait of choice for the day is usually a okay topic but don’t expect people to give up the location of their favorite honey hole. If they did, it probably wouldn’t be much of a hole soon enough. With all of the above I now have a pretty decent base of information that will at least allow us to target some specific areas of the lake.